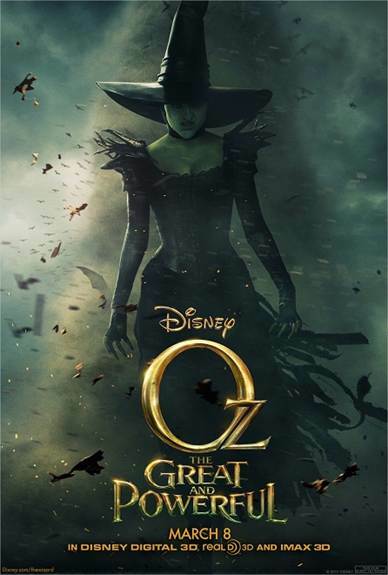 Womanizing carnival magician Oscar (James Franco) escapes from the vengeful boyfriend of a recent conquest via hot air balloon, but soon finds himself swept away to a magical land via tornado in OZ THE GREAT AND POWERFUL. Grateful to have survived, Oscar swears to change his ways. When Oscar finds himself caught in the middle of a fight between three witches – Theodora (Mila Kunis), Glinda (Michelle Williams) and Evanora (Rachael Weisz) for control of the Emerald City, however, his old cad instincts kick in again as he tries to play the angles in the way that will benefit him the most. With the whole kingdom counting on him, can Oscar finally turn over a new leaf and become the great wizard everyone says he is? Unless you somehow have absolutely no knowledge of Frank L. Baum's The Wizard of Oz and its 1939 film adaptation, it's not much of a mystery. We know where the Wizard winds up; we just didn't know how he got there. Well, thanks to OZ THE GREAT AND POWERFUL, now we do. We also get a couple of new magical characters to take the place of the Cowardly Lion (seen briefly, or at least I think it was supposed to be him), Tin Man, and Scarecrow: Finley (voiced by Zach Braff) is a flying monkey who finds himself stuck helping Oscar with his deceptions, and a little girl made out of China (Joey King) who may be fragile, but certainly isn't weak. As long as you don't go in expecting a film that can match the enduring charms of THE WIZARD OF OZ, you won't be disappointed in director Sam Raimi's lightweight but enjoyable prequel. Sure, it has a modern day special effects sheen, but it also has a strong emphasis on story and character. And while on the surface the film trades in the same tried and true themes about being yourself and finding inner strength that seem to be the only message Hollywood is willing to risk putting into a family film these days, it does so in a more complex and thoughtful manner than your average throwaway kid vid. Lately it seems like every fairy tale and children's adventure story has been given a dark and twisted makeover for the silver screen. OZ turns its back on that trend, opting for mostly bright colors and an optimistic, but not naïve, world-view. The film also takes a refreshing moral stance against killing. I enjoy a good bit of violence and mayhem in my movies, make no mistake. I'm just tired of so many fantasy films, especially the ones aimed at families and kids, being so cavalier about the taking of life. Here we have a film that takes an overt stand that killing is not the answer, sticks to its guns, and still manages to deliver an exciting and imaginative climax. Sam Raimi proves the perfect choice to direct with his knack for frenetic yet coherent camera work, love of old fashioned Hollywood comedy, and penchant for likable heels as lead characters all coming into play. Although he's not credited as a screenwriter, the film's black and white Kansas section in particular feels very much like something Raimi might have written. It could just be that James Franco is doing his best to channel long-time Raimi star/collaborator Bruce Campbell (who appears in a bit part) with his delivery, but given the way credits are assigned in movies due to various Guild rules, it wouldn't surprise me a bit to learn that Raimi had made his own tweaks to the screenplay. As much as I enjoyed OZ, I don't want to oversell it. It has issues, chief of which is one that plagues a lot of movies these days: it's just too damn long. An hour and a half running time would have served this story much better. At least part of the reason the film drags is that once we find ourselves over the rainbow, the dialogue becomes noticeably blander. There just aren't any memorable lines the likes of, “I've a feeling we're not in Kansas any more.,” or “I'll get you, my pretty, and your little dog, too!” But hey, give the film credit. At least it has dialogue that serves to develop its characters and embellish its themes and story, not just characters yelling banalities like, “look out” or “fire the catapult” at each other. It probably also bears mentioning that this trip to Oz doesn't include any song and dance numbers, which might have served to liven things up a bit in the dry patches. 3 out of 4 stars.